The M210e micro OTDR works with the DFS1 Digital FiberScope (see â€œDFS1 Digital FiberScopeâ€ listing or email for spec esales@tamge.com). M210e micro OTDRs are ideal for testing, analyzing and troubleshooting enterprise, LAN/WAN, campus and military single-mode and multimode (62.5 and 50 micron) fiber networks. The M210e micro OTDR includes integrated Visual Fault Locator (VFL) and Optical Power Meter (OPM) and a crisp touch display suitable for both indoor and outdoor operation. 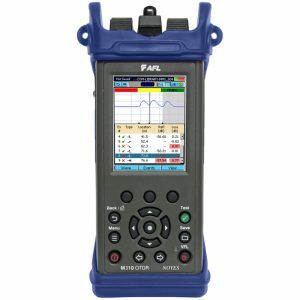 All M210e models support IEC 61300-3-35 fiber end-face visual inspection practices using a NOYES DFS1 Digital FiberScope. OTDR traces (.sor format), OPM measurement results and fiber end-face images can be saved together in a job. These results can be downloaded to a computer for analyzing and editing using the included companion, TRMÂ® 2.0 Test Results Manager trace analysis and reporting PC software (Basic License).